Rubies, Pink Sapphires and similar shades. 95% of the stone set rings shown below have been made entirely in our workshops in Chichester. Each ring is a one-off, designed and made as a unique piece of bespoke jewellery. They show the high quality of work and the myriad of designs and styles that we are able to produce. The central faceted oval cushion cut ruby 2.54ct and is claw set in 18ct yellow gold, the surrounding 10 round brilliant cut diamonds are claw set in platinum, total diamond weight is 1.67ct. Middle and left - pink tourmaline and diamond. Right - pink sapphire and diamond. 18ct yellow gold ruby and diamond millegrain edge cluster ring with marquise diamond “leaf” shoulders. 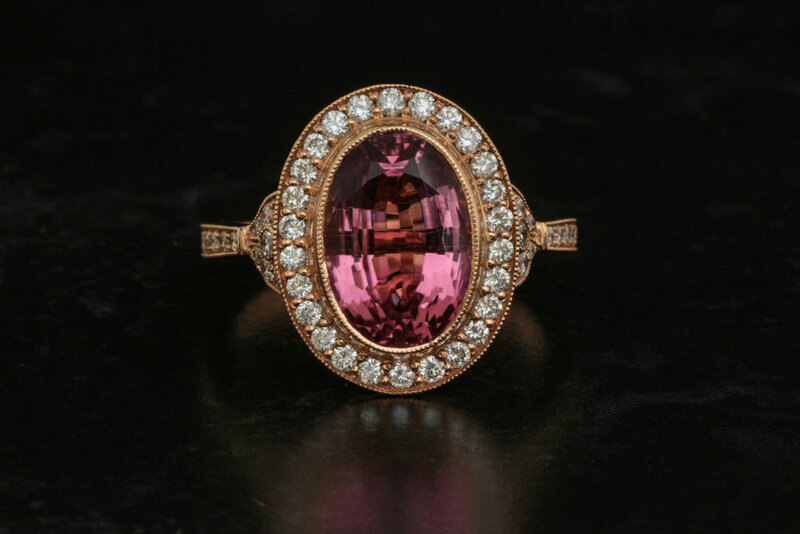 18ct pink tourmaline and diamond oval 1920’s style cluster ring. Kunzite set ribbed shoulder set dress ring. Ruby and Diamond Cluster Ring. The oval faceted Burmese ruby is 3.03ct and has been set in 12 fine, talon style claws and surrounded with a rubover set cluster of 12 modern round brilliant cut diamond with a combined weight of 1.04ct, graded for colour and clarity as G/H and VS1/2 respectively. Ruby certificated by The Gem and Pearl Laboratory, report number 13969. Hallmarked 950, Platinum and with the Chichester Cross mark. Ruby and Diamond Three Stone Ring in Platinum The central oval cut ruby (1.83ct) has been certified by GPL (certificate number 11557) has been set with four claws between two modern round brilliant cut diamonds. 3.08ct grape garnet in Art Deco style mount. Made in Chichester, England. Natural pink cushion cut diamond in Art Deco style mount. Made in Chichester, England. Purple sapphire and half moon diamonds. Made in Chichester, England. 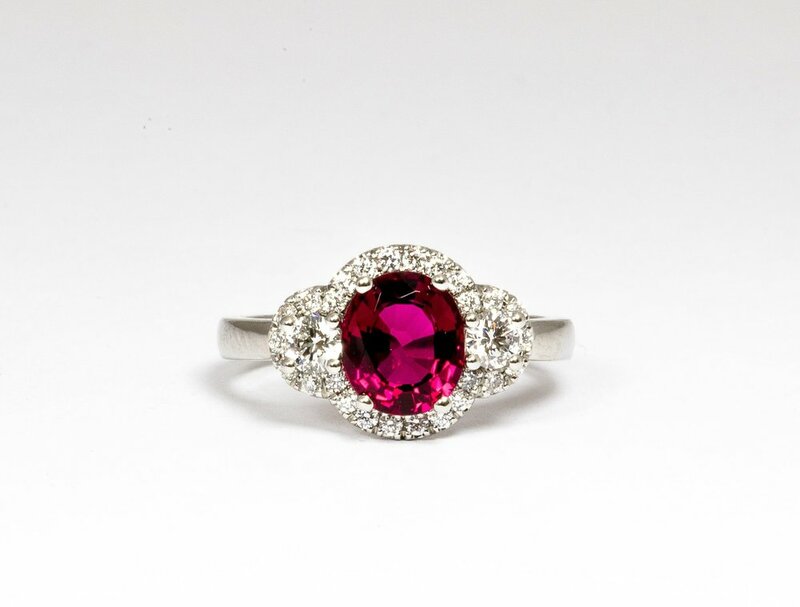 Platinum mounted 1.03ct ruby and diamond ring. Made in Chichester, England. 18ct rose gold mounted 0.80ct orange sapphire pear shaped cluster ring. Made in Chichester, England. 18ct Rose gold mounted 4.16ct pink tourmaline cluster ring. Made in Chichester, England. 2.57ct pink sapphire and diamond cluster ring. Platinum. Made in Chichester, England. 6.82ct Pear-shaped Kunzite and diamond cluster ring. Made in Chichester, England. D colour centre oval diamond with natural pink diamond surround. Made in Chichester, England. 18ct yellow gold ruby and diamond cluster ring. Made in Chichester, England. 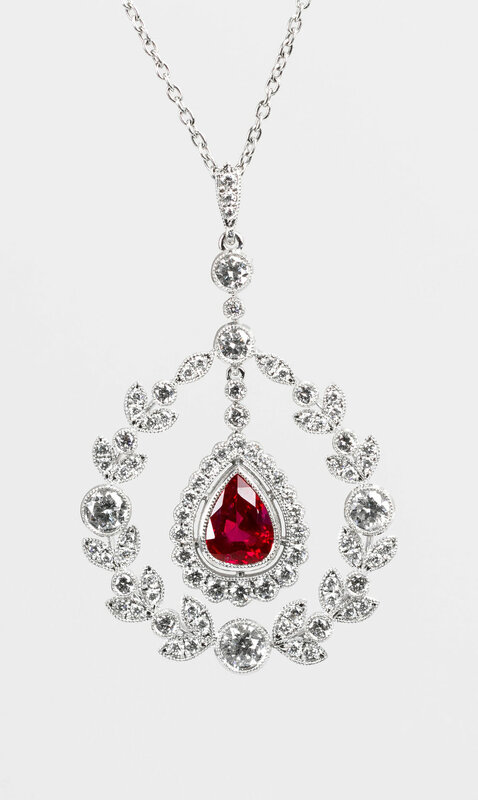 Edwardian style pear shaped ruby and diamond pendant. Made in Chichester, England. Platinum mounted Burmese ruby and diamond half hoop ring. Made in Chichester, England. 18ct yellow gold ruby and diamond rub-over set 7 stone ring. Made in Chichester, England. Platinum mounted, diamond and cushion cut grape garnet Edwardian style cluster ring. Made in Chichester, England. 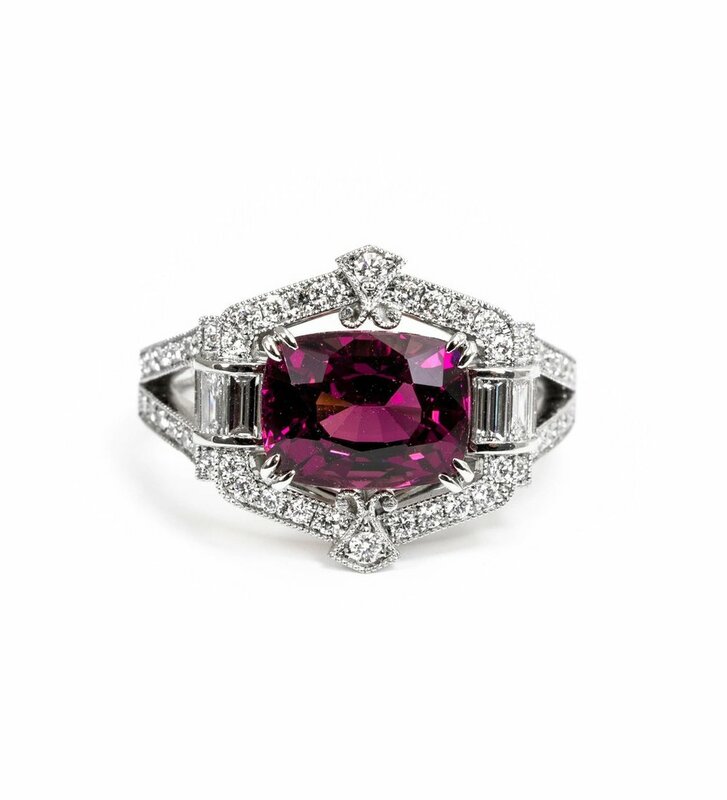 Platinum mounted diamond and rubellite set cluster ring. Made in Chichester, England. 18ct rose gold mounted, pale pink, pear-shaped sapphire with diamond surround and diamond set shoulders. Made in Chichester, England. Platinum mounted, vivid pink oval sapphire and diamond triple cluster ring. Made in Chichester, England. Platinum mounted pink sapphire and diamond classic 3 stone ring. Made in Chichester, England. Vivid pink sapphire and princess cut diamond 3 stone ring with grain set diamond shoulders, Made in Chichester, England. Platinum mounted emerald cut diamond and pink pear shaped sapphire 3 stone ring. Made in Chichester, England. Platinum mounted pear shaped ruby and diamond cluster ring with claw setting for the ruby and cut-away setting for the diamonds. Made in Chichester, England. 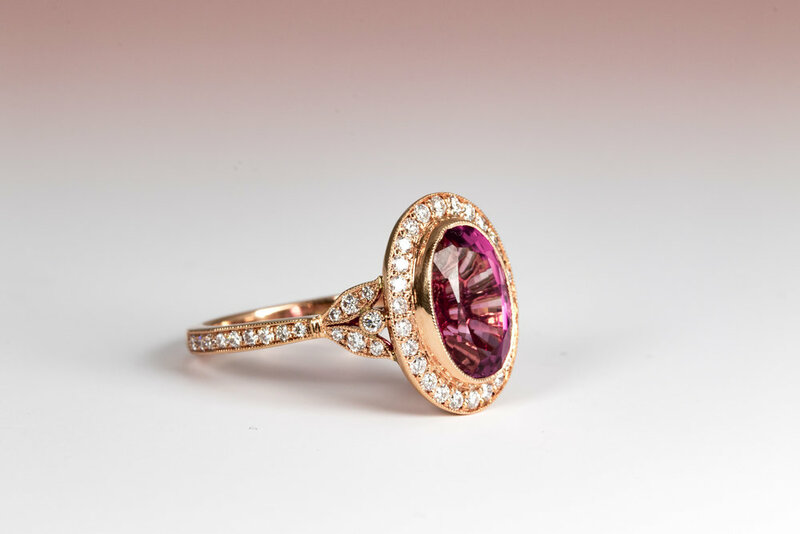 18ct rose gold mounted oval pale pink sapphire and diamond cluster. The centre sapphire being claw set and the diamonds grain set with millegrain edge decoration. Platinum mounted rounded cushion shaped double row halo cluster ring with split diamond set shoulders. Made in Chichester, England.